Adorable lamp would be perfet for the bedroom dresser or your vanity. 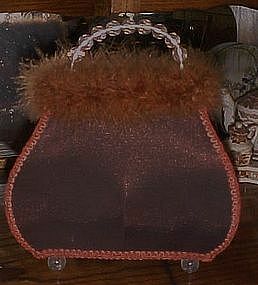 brown silky fabric with plastic beaded handle and fur trim. electric with switch on the cord for easy on/off. Measures 11" tall and 9 1/2" long. Works perfect. Uses 15 watt bulb (Christmas light bulb size). Like new condition!